[Episcopal News Service] Wildfires. Hurricanes. Four straight record-setting years of increasing temperatures. Ocean acidification. Sea-level rise. Species loss. Drought. All are made worse by climate change, fueling humanitarian crises as people are forced to flee their homes because of natural disaster or changes in their environment. “Earth’s climate is now changing faster than at any point in the history of modern civilization, primarily as a result of human activities,” warns the 1,656-page National Climate Assessment released Nov. 23 by the Trump administration. On Sunday, Dec. 2, representatives from United Nations member states, including government, nonprofit and faith-based organizations, will meet in Katowice, Poland, for the 24th Conference of the Parties to the United Nations Framework Convention on Climate Change, or COP24, to hammer out a framework for implementing the Paris Agreement, which was reached in 2015 at the 21st conference. “Not only have all the nations of the world signed the Paris Agreement, I have seen the great religions of the world and the indigenous spiritual traditions also come together to seek the healing of the planet,” said California Bishop Marc Andrus in an email to Episcopal News Service. Andrus will lead an eight-member delegation representing Presiding Bishop Michael Curry at the Dec. 2-14 conference in Poland. This is the fourth Episcopal delegation to attend the annual conference on climate change. The Episcopal Church began attending the conference in 2015 in France, where the Paris Agreement was reached. In Paris, the Episcopal delegation made a spiritual case for climate action. At that conference, member countries, including the United States, reached a landmark agreement to set voluntary goals aimed at keeping global warming well below 2 degrees Celsius, which scientists predicted would be necessary to prevent a spiraling catastrophe of melting glaciers, rising sea levels and related weather extremes. 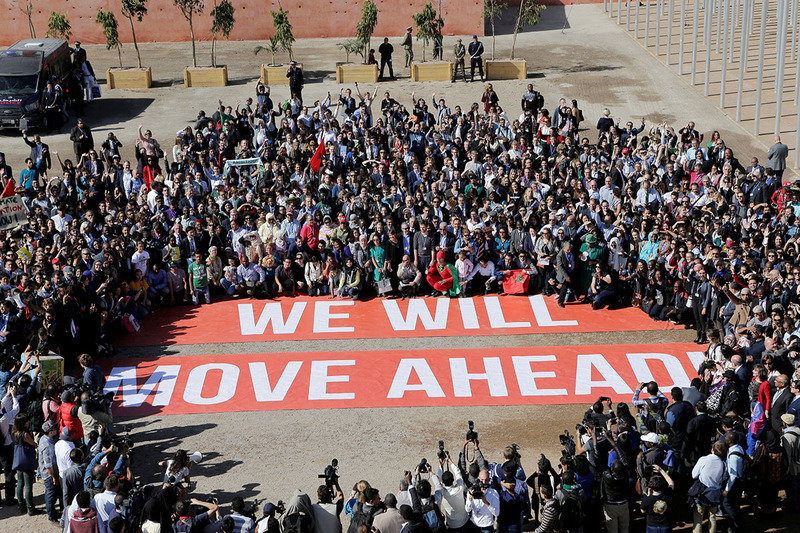 In Morocco in 2017, nations reaffirmed their commitment to cut carbon emissions. In Germany, in 2018, the process was thrown into doubt by President Donald Trump’s pledge to pull the United States out of the Paris Agreement. The United States is the world’s largest economy and its second largest emitter of greenhouse gases, which trap heat in the atmosphere and make the planet warmer. It was in June 2017, as part of his “American First” strategy, that Trump announced the United States’ withdrawal from the international agreement, saying it undermines the economy and places the United States at a disadvantage. Since then, the We Are Still In movement has taken root, with more than 200 faith organizations signing on, including Episcopal churches. Still, the world is far from meeting the Paris Agreement’s target, which would require reducing the amount of carbon dioxide emitted into the atmosphere to pre-industrial levels. In fact, emissions continue to rise. The conference in Poland is intended “to finalize the rulebook for how the Paris Agreement will work. … That’s important because if you don’t have rules, it falls apart at this level of bureaucracy,” said Lynnaia Main, the Episcopal Church’s representative to the United Nations. Scientists agree that climate change is a global threat. The World Meteorological Organization warns that, given current trends, warming could reach between 3 and 5 degrees Celsius by the end of the century. The Intergovernmental Panel on Climate Change, which informs U.N. policy, issued a similarly dire report. “I have quoted many times in the past decade something that was said by the former archbishop of Canterbury, Rowan Williams: ‘It takes a global body to deal with global problems.’ An example of how this is true is the increasing crisis of environmental refugees,” Andrus said. “Have you wondered what was the engine that drove the closely watched caravan out of Central America? According to an Oct. 30, 2018, Guardian article, in addition to violence, organized crime and systematic corruption, ‘climate change in the region is exacerbating – and sometimes causing – a miasma of other problems, including crop failures and poverty.’ The caravan comes mainly from Guatemala, Honduras and El Salvador, it crosses Mexico and seeks asylum in the United States. … The struggle of the people in the caravan is transnational, and I would say cannot be ‘solved’ by any one country. We must work together for the good of all,” Andrus said. Environmental justice is one of the church’s three main priorities, along with racial reconciliation and evangelism. Over the years, General Convention has passed numerous resolutions on the issue, whether supporting federal climate action or pledging to mitigate the church’s own impact on the environment. The church’s 79th General Convention met in July in Austin, Texas, and passed 19 environmental resolutions, including support for a national carbon tax, carbon offsets for church-related travel, ocean health and Episcopalians’ continued participation in the Paris Agreement. In 2016, the Episcopal Church was granted U.N. observer status, which allows members of the delegation to brief U.N. representatives on the Episcopal Church’s General Convention climate resolutions and to attend meetings in the official zone.